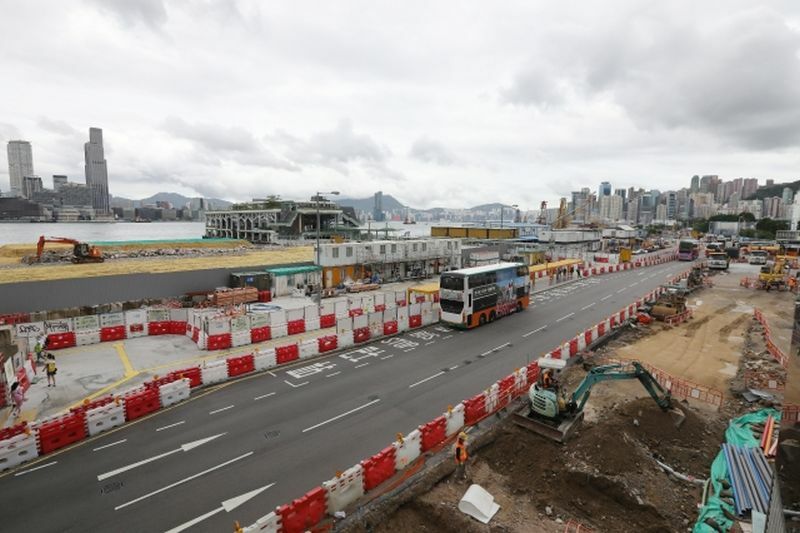 The MTR Corporation has stopped all excavation work at the Exhibition Centre station in Wan Chai, after reports revealed that 14 areas around the station have sunk beyond acceptable limits. The MTRC knew of the issues as late as January last year, but work was not halted. After reports revealed the data on Friday, new Projects Director Jacob Kam announced digging work would stop, following a request by the Highways Department. 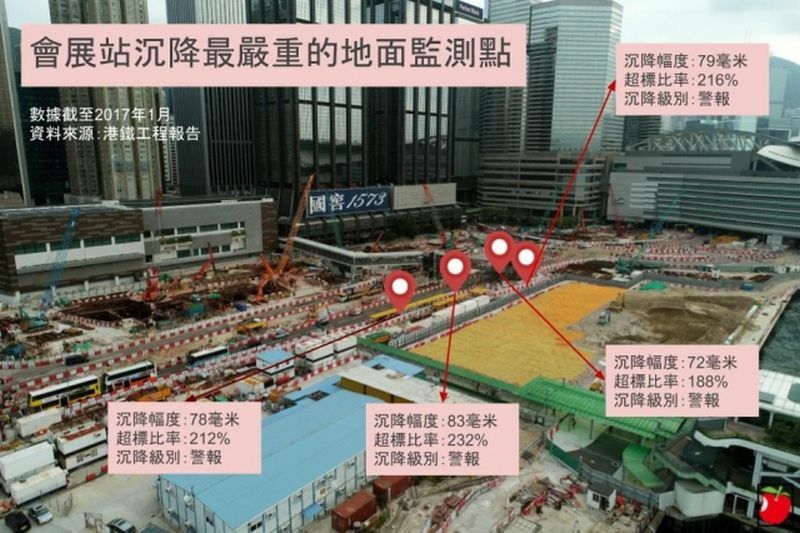 Work at the station – part of the upcoming Shatin to Central Link – is monitored for three different levels of sinking: “alert” at 12mm, “action” at 18mm, and “alarm” at 25mm. It has been under construction since 2012. Sinking at the Exhibition Centre station. Top number refers to millimetres of sinking, percentage refers to the percentage above limit. Photo: Apple Daily. According to an internal engineering monitoring report in January 2017 obtained by Apple Daily, if sinking reaches “alarm” level, construction work should stop until written approval from engineers is obtained. But sources told the newspaper work did not stop in the past, even though the level had been reached. The most severe sinking occurred at a location near the former Wan Chai ferry pier, which sank 83mm, much higher than the alarm level. The locations that sank were all above ground or at public facilities. A water pipe near the Eastern side of the Renaissance Hong Kong Harbour View Hotel on Fleming road sunk 37mm, almost 50 per cent over the alarm level. Exhibition Centre station. Photo: Apple Daily. Meanwhile, there were 16 locations where the sinking reached “alert” level, whislt four reached the “action” level. There were 707 monitoring devices set up near the site. Of which, 264 were on the ground, 224 were for public facilities, and 219 were for buildings. Devices set up at nearby buildings did not detect sinking that exceeded limits. Reports surrounding the sinking at the Exhibition Centre station came after similar reports of buildings sinking beyond acceptable limits near the To Kwa Wan station, also on the Shatin to Central Link. 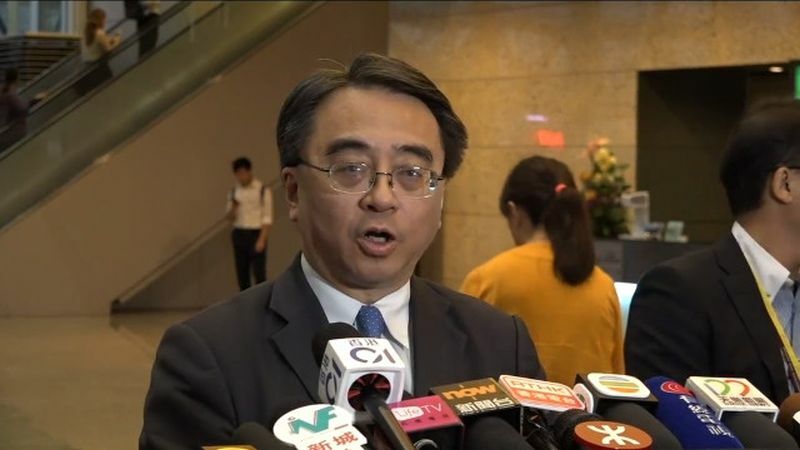 Jacob Kam, who was appointed the new projects director just three days ago, said that digging was stopped to allow time to review all relevant records and to ensure safety. Kam said he did not know how long work would be halted. “We all know that Wan Chai North is a reclaimed area, and there are other infrastructure projects under construction. Settlement could be significant,” Kam said. Jacob Kam. Photo: Apple Daily. “Today, I made two decisions: first… to reassure the public and to put safety first, all excavation works at the Exhibition Centre will be stopped. 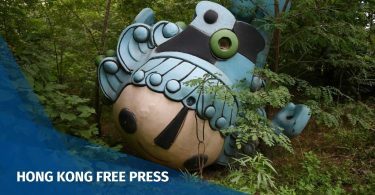 We will only resume work after we have had time to look at all the records, and ensure that construction complies with various standards,” Kam said. He said if the public believed their properties and buildings were affected by rail projects, they can call 2993 3333 to contact MTRC. The MTRC will send contractors and engineering staff to inspect the situation. 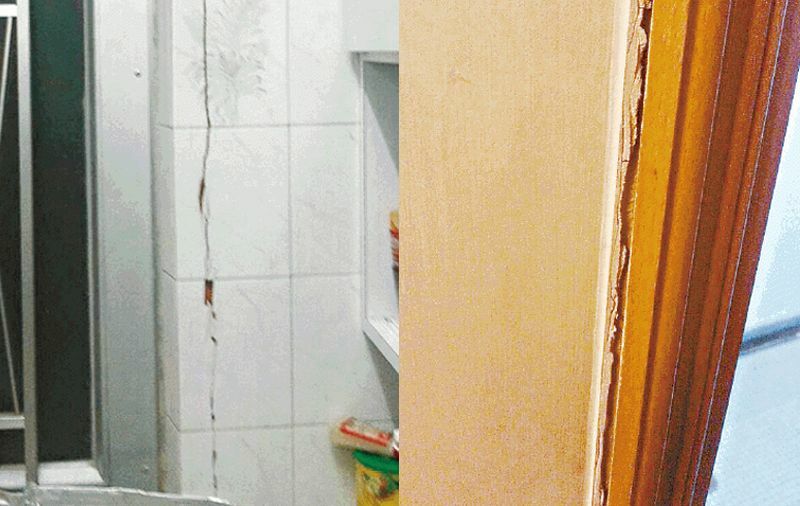 Walls of a flat in To Kwa Wan show cracks after the MTRC construction began. Photo: Apple Daily. Residents who suffer loss due to nearby MTR construction are regularly referred to an independent claims adjuster to determine compensation. 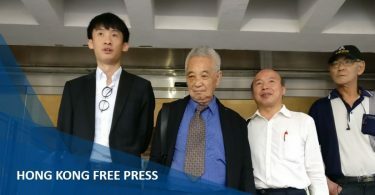 Citing sources, Apple Daily reported on Friday that a claims adjuster retained by the MTRC would submit their reports to MTRC executives “for approval.” A district councillor said there were hundreds of complaints from To Kwa Wan residents, but no one had received compensation so far. “We wanted to check the reports to see if certain details were factually accurate, such as the location of a flat’s entrance. But we understand there may be questions about how we handle this,” Kam said.